Partnering with ADLINK gives our customers and partners options for IoT devices and data sources ready to use out of the box. 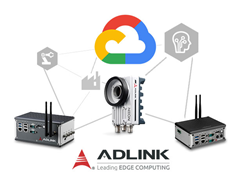 ADLINK Technology, a global provider of leading Edge Computing solutions, has partnered with Google Cloud to integrate ADLINK’s hardware and software solutions with Google Cloud IoT offerings, providing customers with an easy path to added business value by harnessing and analyzing critical operational data. ADLINK’s contribution of integrated hardware and software also includes ADLINK Edge™ services to channel operational data and enable intelligent decision-making by streaming to Google Cloud for deeper insight. With no programming necessary, ADLINK Edge™ quickly connects previously unconnected operational equipment and sensors. By tapping into native communication protocols, data can be captured and streamed at the edge and securely between devices, databases and to GCP, enabling analysis and easy visualization to inform business decisions and optimize operations. For more information on ADLINK’s Edge IoT offerings with Google Cloud, visit https://www.adlinktech.com/en/Google-Cloud.aspx.